The Consejeria De Los Derechos de los Beneficios del seguro de Desempleo (Spanish) is an unemployment law poster by the Nebraska Department Of Labor. This is an optional poster, so while it is recommended that you post this if it is relevant to your employees, you are not required to by the Department Of Labor. This poster, written in Spanish, is optional to post and describes who qualifies for unemployment benefits and how to apply for these benefits. It appears you don't have a PDF plugin for this browser. 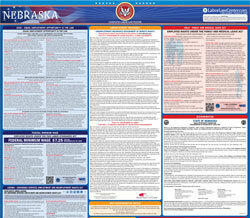 Please see the link below to download nebraska-ui-advisement-of-benefit-rights-spanish.pdf. justificada, puede establecer una fecha de vigencia diferente. año de beneficios que incluye la mayor parte de dicha semana. devuelto, independientemente de la causa.